Did I even mention that I was headed to High Point this weekend for the semiannual market? It’s been a whirlwind of activity down here but I wanted to give you a little preview of what I’ve been seeing at this enormous design venue. Much more to come very soon. This entry posted in art, design, furniture, interior design. 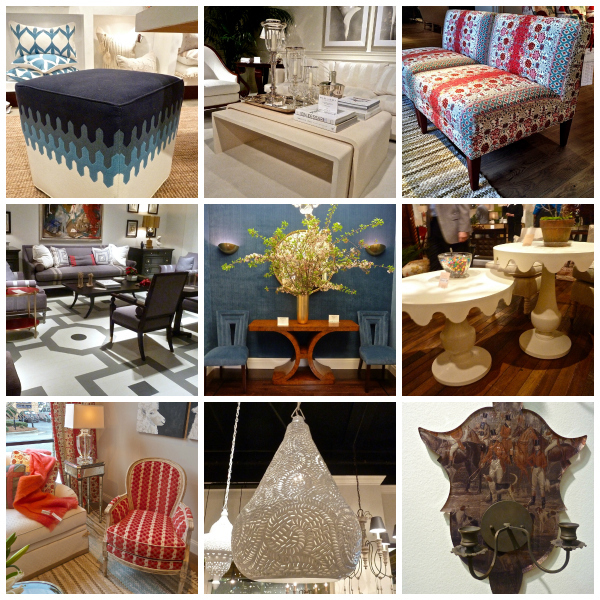 Entry Tags: Designer furniture, High Point Market, High Point spring 2014 Bookmark the permalink. Please send as much as you can from HP Market. Lived there for 38 years and use to work for Chelsea House. Love to see new products!!!!!!! I hope you will write about the patterned sofas and chairs you’re showing–they look terrific! Wonderful post ! Could you tell me who made the ottoman in the first photo ? Thank you! Love these pics and look forward to more! Such fun to see our rug (top right and bottom left) accenting the wonderful furniture at Wesley Hall! Stacey it is such a thrill to see the new designer lines with such unique shapes! Love what appears to be embroidered patterns on the ottoman and slipper chairs…thanks for sharing with those of us who could not attend. We popped down for the day on Sunday to scout out a booth in Salon… What a huge show filled with gorgeous goodies! We know you’ll come back with some fabulous finds. 78 queries in 0.420 seconds.